The crisis of food insecurity and hunger in the United States continues to grow. A 2016 study done by researchers at Children’s Health Watch and the Greater Boston Food Bank, report that the estimated health-related costs of food insecurity and hunger in the United States is $160 billion dollars. In Massachusetts the estimated health costs associated with food insecurity and hunger are $2.4 billion dollars. For the last 30 years Bread of Life, Inc., a community based non-profit agency, serving Malden and several surrounding communities has been fighting the crisis of food insecurity and hunger. One in ten households in MA continue to suffer from food insecurity and hunger. Rates during the most recent “great recession” in 2008, have yet to return to “pre-recession” levels in Massachusetts. Bread of Life provides more than one million meals each year to children, adults and families who continue to suffer from food insecurity and hunger. In order to combat this crisis Bread of Life is embarking on a Capital Campaign to construct a new facility to better meet the needs of our clients and communities we serve. Our new facility will not only meet the needs of our clients and communities but will also provide fourteen 14 low-income studio housing units through a collaboration with Metro North Housing Corp (MNHC) which will own and manage that portion of the facility. To date, Bread of Life has secured nearly half of the $2.9 million in funding needed, including pledges of $250,000 each from Beth Israel Senior Citizens Housing, Inc., the Clipper Ship Foundation and the Donovan Family Foundation. Other grantors to the campaign include private individuals and businesses, Brookline Bank, the Amelia Peabody Charitable Foundation, the Arthur S. Reinherz Charitable Foundation, the Ludcke Foundation, People’s United Community Foundation, Brookline Bank, Grainger Foundation and Eastern Bank Charitable Foundation, among others. See our complete list of funders. Our remaining philanthropic goal is $1.6 million. The total projected cost of the development, including acquisition, contingencies and soft costs, is $7.4 million. 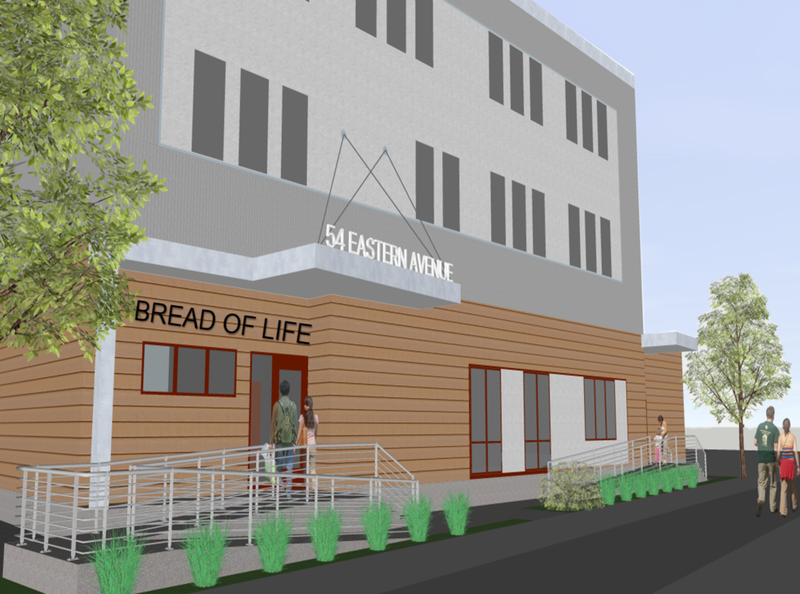 Bread of Life will own 6,361 square feet and has anticipated development costs of $2.9 million. MNHC will own 14 low-income studio apartments, totaling 8,531 square feet with development costs of $4.5 million. A gift to the Under One Roof campaign is an opportunity to help us achieve our mission to feed the body and nurture the soul. Your gift also presents a unique opportunity to be permanently recognized in our new space. Learn more on our Naming Opportunities page. What are the best days/times to reach you by phone? Thank you for your interest in the Under One Roof Campaign. We will follow up with you by phone as soon as possible. MNHC is financing their portion with state and federal low-income housing funds. The North Suburban HOME Consortium awarded $1.2 million to the project. In December 2017 the Federal Home Loan Bank Affordable Housing Program and Century Bank (through a FHLB Member Loan) awarded $1.4 million to the project. Also in December 2017, MNHC purchased two other properties in Malden that provide supported housing for formerly homeless individuals and veterans: the Kaszanek House and the Washington Street SRO Residence. MNHC will own and manage these properties along with the 54 Eastern Ave units being created.